Mater Dei head coach Bruce Rollinson opened his 29th fall camp Monday. The legendary coach, who owns a record of 272-83-2, is excited for what should be an outstanding season for the Monarchs, who begin the year ranked No. 2 in the High School Football America Preseason Top 100 that is created with our proprietary algorithm. 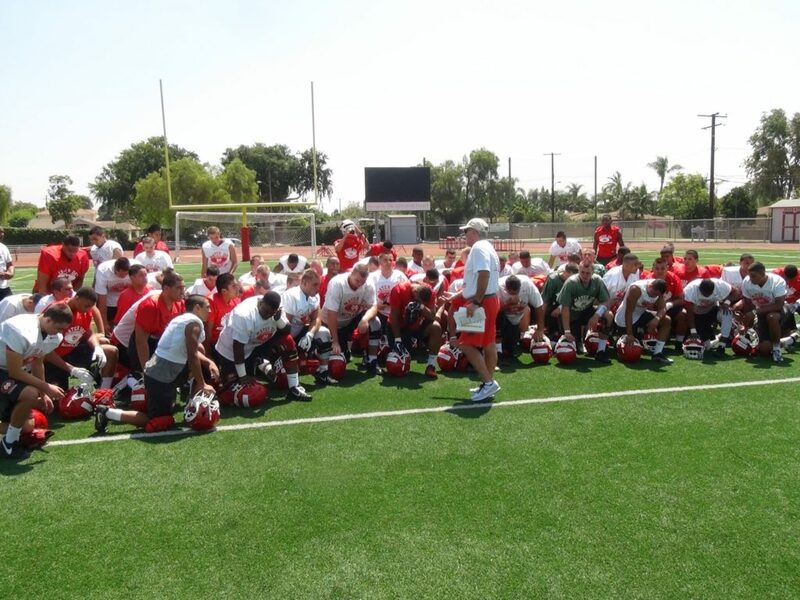 Mater Dei head coach Bruce Rollinson talks to his Monarchs after Monday morning practice. Rollinson returns 10 of 11 starters from an offense that averaged over 53 points a game last year. The offense is triggered by junior J.T. Daniels, who on Sunday gave his verbal commitment to USC. Daniels, who has thrown for 100 touchdown passes, is considered the No. 1 QB in the nation in the Class of 2019. J.T. Daniels (green jersey) under center during morning practice session. After Monday’s first practice, I spoke with Daniels on Facebook LIVE about the upcoming season and his decision to commit to the Trojans, following in the footsteps of Mater Dei alums Matt Leinart and Matt Barkley. Daniels has plenty of weapons to choose from with the return of Amon-Ra St. Brown (60 catches, 21 TDs), CJ Parks (51 catches, 9 TDs), Nikko Remigio (46 catches, 7 TDs) and Bru McCoy (28 catches, 5 TDs). St. Brown will be brought along slowly during camp as he continues to heal from a finger injury that he suffered at The Opening. Rollinson knows that the skill players will benefit from an offensive line that he began building in 2015 when he started five sophomores. 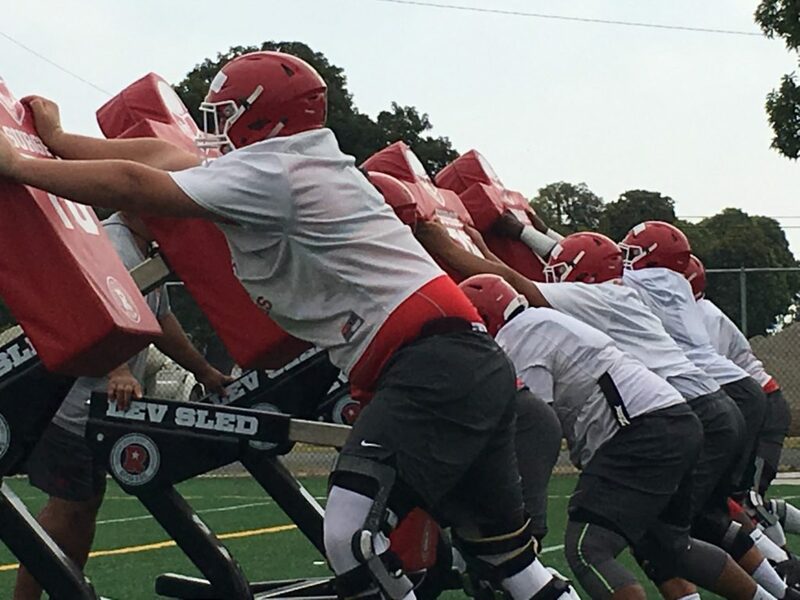 Mater Dei offensive line hits the sled Monday morning. The offensive line is led by 6-7, 315 Alabama-recruit Tommy Brown at left tackle. Joining Brown up-front is center Kekanioka Gonzalez, who makes the line calls, along with guards Chris Murray, who has 15 scholarship offers, and Mason Kolinchak. At right tackle, Rollinson will start sophomore Myles Murao in place of Andrew Faoliu, who’s been switched to the defensive line. On defense, Rollinson will have to replace four all-Trinity League players, but he’s happy to have back senior Nathan Logoleo, who had 61 tackles and three sacks in 2016, back on the defensive line. The linebacking corp will be solid with the addition of Solomon Tuliaupupu transferring from Claremont High School where he recorded 126 tackles last year, 18 for a loss. With over 30 college scholarship offers, Tuliaupupu is considered the No. 3 inside linebacker in the Class of 2018. Rollinson will have to rebuild the entire secondary due to graduation. 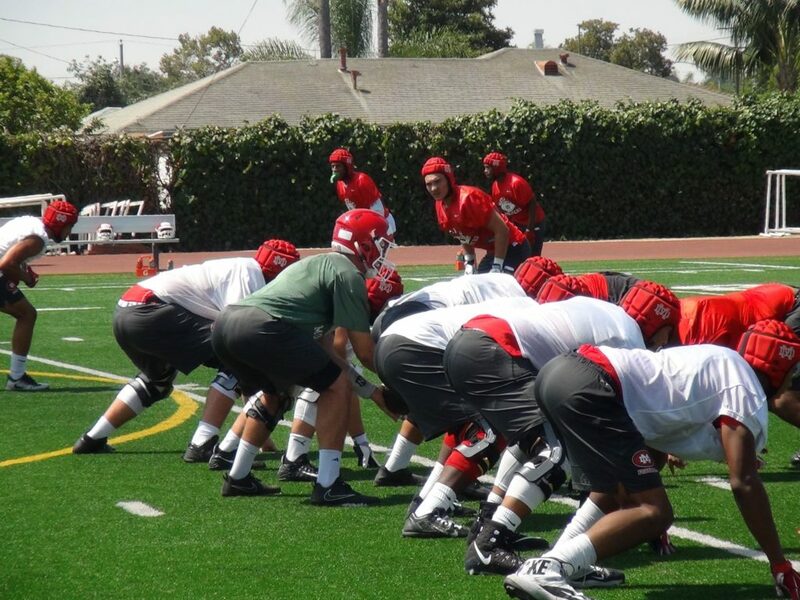 Aside from its tough Trinity League schedule, Mater Dei will square-off with No. 4 Bishop Gorman (Nevada) on September 1 and No. 15 Bergen Catholic (New Jersey) and September 15.